On March 28, 1979, America experienced its worst nuclear accident - a partial meltdown of the reactor core at the Three Mile Island nuclear power plant near Middletown, Pennsylvania. During the tension-packed week that followed, sketchy reports and conflicting information led to panic, and more than one hundred thousand residents, mostly children and pregnant women, fled the area. Early on the morning of March 28, several water-coolant pumps failed on the second reactor at Three Mile Island (TMI-2), causing the reactor to overheat. The reactor shut itself down eight seconds later, but the core temperature continued to rise because valves controlling the emergency cooling water were stuck closed. Sixteen hours later, the core was finally flooded and its temperature brought under control. By this time, half of the core had melted, and part of it had disintegrated, although it was years before scientists actually discovered that a meltdown had occurred. TMI-2 had only been in operation for 90 days when the accident occurred. On March 30, later known as "Black Friday," rumors circulated about an uncontrolled release of radiation from the plant and Pennsylvania's governor ordered the evacuation of children and pregnant women living within 5 miles of the plant. Later, it was learned that the release had been planned to ease pressure within the system. On April 2, 1979, five days after the meltdown, the crisis at Three Mile Island was officially declared to be over. Although TMI-2's containment held and only minimal radioactive material was released, the reactor was heavily contaminated. No one could enter the plant for two years. The TMI-2 reactor was eventually entombed in concrete and TMI-1 was restarted in 1986. A combination of equipment failure, human error, and bad luck, the nuclear accident at Three Mile Island stunned the nation and permanently changed the nuclear industry in America. Even though it led to no immediate deaths or injuries to plant workers or members of the nearby community, the TMI accident had a devastating impact on the nuclear power industry - the Nuclear Regulatory Commission has not reviewed an application to build a new nuclear power plant in the United States since. It also brought about sweeping changes involving emergency response planning, reactor operator training, human factors engineering, radiation protection, and many other areas of nuclear power plant operations. 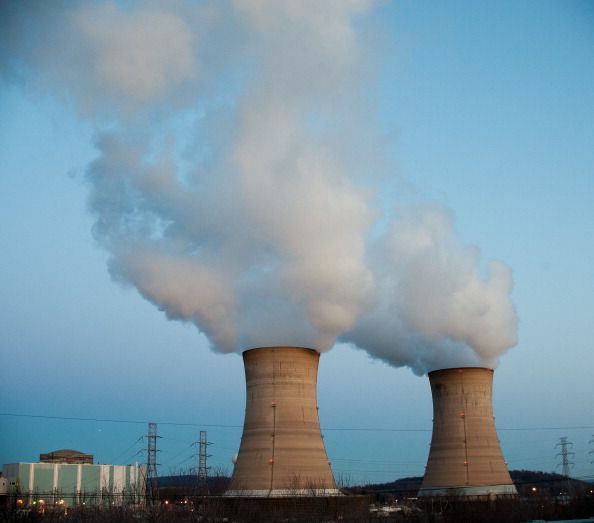 Various studies on health effects, including a 2002 study conducted by the University of Pittsburgh, have determined the average radiation dose to individuals near Three Mile Island at the time of the meltdown was about 1 millirem - much less than the average, annual, natural background dose for residents of the central Pennsylvania region. Twenty-five years later, there has been no significant rise in cancer deaths among residents living near the Three Mile Island site. A new analysis of health statistics in the region conducted by the Radiation and Public Health Project has, however, found that death rates for infants, children, and the elderly soared in the first two years after the Three Mile Island accident in Dauphin and surrounding counties. Today, the TMI-2 reactor is permanently shut down and defueled, with the reactor coolant system drained, the radioactive water decontaminated and evaporated, radioactive waste shipped off-site to an appropriate disposal site, reactor fuel, and core debris shipped off-site to a Department of Energy facility, and the remainder of the site being monitored. Originally, there was the talk of decommissioning Unit 2 when its license expires in April 2014, but plans submitted in 2013 by FirstEnergy, which owns Unit 1, now call for "dismantling the mothballed Unit 2 along with the operational Unit 1 when its license expires in 2034." The decommissioning would take place over a ten year period, with full site restoration by 2054 — 75 years after the accident.